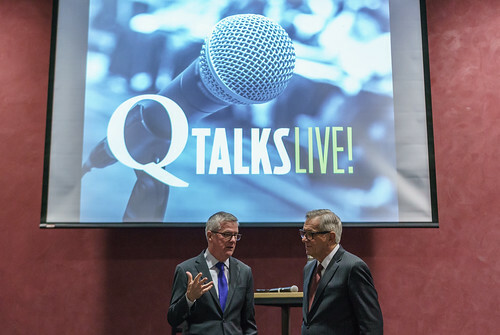 Professor Tim Classen at the inaugural Q Talks: Live! event. Classen was one of three featured speakers at Q Talks, which also featured Professor Jenna Drenten on how visual social media is changing communication and Professor Al Gini on the importance of humor. Q Talks is part of the Dean’s Alumni Series. Vicodin, Percocet, Norco, and OxyContin are examples of prescription opioid painkillers. Vicodin was released 40 years ago, and OxyContin came to market in 1996. Heroin, morphine, and fentanyl are also examples of opioids. In 2001, the Joint Commission on Accreditation of Healthcare Organizations identified pain as the fifth vital sign along with blood pressure, heart rate, respiratory rate, and temperature. According to Classen, between 1998 and 2010, the number of prescriptions for opioid painkillers doubled. In 2015, doctors wrote 250 million prescriptions for opioid painkillers – or one for every adult in the U.S. Number of fatal overdoses: Between 1999 and 2016, approximately 150,000 people suffered fatal overdoses from prescription opioids, with 40,000 deaths from all opioids in 2016 alone. Fatal overdoses by gender/race: White males from 18 to 40 years old and white females from 18 to 40 years old have seen the greatest increase of overdoses since 1999 compared to older white males/females and non-white males/females. Heroin substitution: In 2010, OxyContin was reformulated so make it harder to crush and insufflate. Many people with opioid additions transitioned to heroin, and heroin overdoses subsequently increased rapidly in 2011. Fentanyl effect: In recent years, fentanyl has become widely available and inexpensive relative to other opioids. This has led to higher rates of overdose overall. In 2016, 10% of all deaths among young white males and young white women were fentanyl overdoses. Geography: The opioid crisis affects the entire U.S., but it is particularly acute in West Virginia, Ohio, Utah, New Hampshire, Maine, and Massachusetts. Illinois has a high heroin overdose rate, while the northeast has suffered the most from the fentanyl epidemic. Prescription drug monitoring programs: All states have created prescription databases to make it harder for patients to fill more than one opioid prescription a month, said Classen. This has helped reduce prescription opioid abuse, but some people have moved on to using heroin and other opioids such as non-prescription fentanyl. Medication-assisted treatment: Medication-assisted treatment is the use of medication such as buprenorphine or methadone to reduce opioid cravings and withdrawal. “This has been identified as an essential remedy for those with opioid problems,” said Classen. Naloxone is now available to reverse opioid overdose and is carried by some police forces. Classen closed his presentation with a series of questions. “At Quinlan, we do focus on ethical business behavior, and here are some things to ponder,” he said. How do we treat addiction and the enormous number of opioid addicts? How do we respond to the role of doctors’ prescribing behavior of opioids that exacerbated this crisis? How do we best treat people with chronic pain? What can we learn to avoid massive unintended consequences of healthcare innovations?